In addition to identifying plants under stress from lack of nutrients or water, remote sensing can also assist in protecting the plants from potential attacks of pests, fungi or bacteria. By combining agricultural knowledge with remotely sensed data, it is possible to have early warning and prevent a pest or a disease from affecting the crops, by taking appropriate action at an early stage. The above multispectral image shows cotton plants that because of favourable conditions, are growing faster than others. These plants (appearing in red) are the most probable targets for an attack of pests or diseases at this particular moment in time. With this knowledge, pesticides need only be applied at the highlighted areas, reducing the cost of the treatment and most importantly the amount of chemicals released to the environment. It is also possible to assess the extent of the damage caused by pests and diseases, by using similar methods to those used to identify stressed plants. The symptoms of such attacks, usually cause the break-down of chlorophyll, and as shown before, we can identify the reduction of chlorophyll concentration in the plants through remote sensing. Question: Look at the patterns on the image above. Can you explain why some cotton plants are growing faster than others? We can see that the fast-growing plants mostly appear in the fields on the right side of the image. Because the effect appears in large regions, the cause is probably related to the general treatments the different areas receive. Possibly the plants were planted at different time and hence they have different ages. Another cause could be linked with the irrigation practice. The small patches of plants not growing as fast, might be linked to the soil conditions at these small areas. A moth larvae eating a leaf. 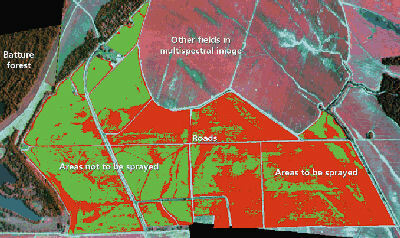 The damage can be detected with remote sensing data, by estimating the loss of leaf area. 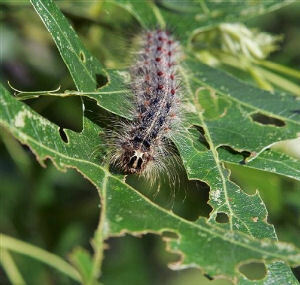 In addition to loss of chlorophyll, pest and diseases can cause the destruction of whole leaves. This leads to a reduction in the total leaf area and as a result, the reduction of the plant's capacity for photosynthesis. As we are able to estimate the Leaf Area Index (LAI) of a group of plants, it is possible to identify an insect attack (such as the one of moth larvae seen above) at an early stage and warn the farmers to take the appropriate measures. 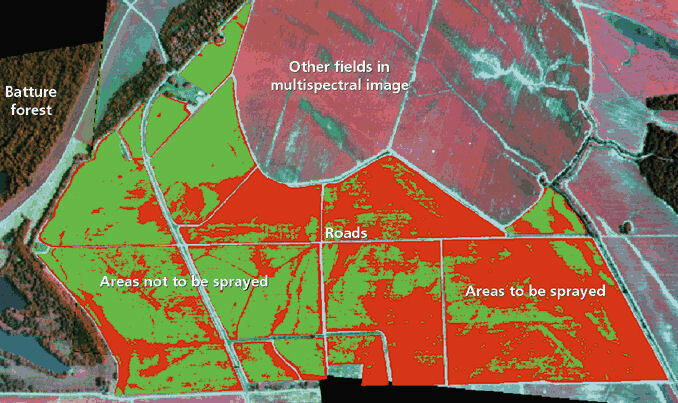 Remote sensing can help identify the plants mostly in need of fertilisers or pesticides and assist in reducing the amount of those chemicals that are used in a crop management regime. For more information see the module on Precision Agriculture. Remote sensing provides us with data from the near-infrared region of the spectrum, which is not visible to the human eye. In combination with information from the visible spectrum, where chlorophyll absorbs energy at specific wavelengths, we can receive information derived from these data, which help us identify stressed plants before the symptoms become visible. Early warning can help the farmers respond quickly and reduce the damage caused to the plants and lost yield.